Paolo Soleri (June 21st, 1919 - April 9th, 2013) was an Italian-American visionary architect with a life-long commitment to research and experimentation in design and town planning. 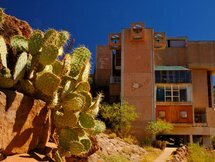 He established Arcosanti, an experimental town north of Phoenix in Arizona using his concept called arcology- a portmanteau of architecture and ecology. Soleri was born in Turin, Italy. He received his Ph.D from the Politecnico di Torino in 1946. He visited the United States in 1947 and spent a year and a half in fellowship with Frank Lloyd Wright at Taliesin West in Arizona, and at Taliesin in Spring Green, Wisconsin. 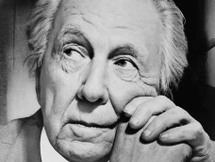 During this time, he gained international recognition for a bridge design displayed at the Museum of Modern Art. Soleri returned to Italy in 1950 where he was commissioned to build a large ceramics factory, "Ceramica Artistica Solimene." The processes he became familiar with in the ceramics industry led to his award-winning designs of ceramic and bronze windbells and siltcast architectural structures. For over 30 years, the proceeds from the windbells have provided funds for construction to test his theoretical work. In 1956 he settled in Scottsdale, Arizona, with his late wife, Colly, and their two daughters. Dr. and Mrs. Soleri made a life-long commitment to research and experimentation in urban planning, establishing the Cosanti Foundation, a non-profit educational foundation. Soleri's philosophy and works have been strongly influenced by the Jesuit paleontologist and philosopher Pierre Teilhard de Chardin. The Foundation's major project is Arcosanti, a planned community for 5,000 people designed by Soleri, under construction since 1970. Located near Cordes Junction, about 70 miles north of Phoenix and visible from Interstate I-17 in central Arizona, the project is based on Soleri's concept of "Arcology", architecture coherent with ecology. An arcology is a hyperdense city designed to maximize human interaction; maximize access to shared, cost-effective infrastructural services like water and sewage; minimize the use of energy, raw materials and land; reduce waste and environmental pollution; and allow interaction with the surrounding natural environment. Arcosanti is the prototype of the desert arcology. Since 1970, over 6,000 people have participated in Arcosanti's construction. Their international affiliation group is called the Arcosanti Arcology Network. As of 2005 Arcosanti stands an estimated 3% complete. Arcologies were used in 1993's SimCity 2000. There were 4 of them. Plymouth Arco, Forest Arco with a dome park on the top, there was one named Draco Arco which looked like a black dragon, and last one was an arcology which looked like Capitol Records Building.